I was recently helping a client setup and configure their Magento newsletter module, and worked to help them get a large part of their subscriber base imported into Magento from external sources. 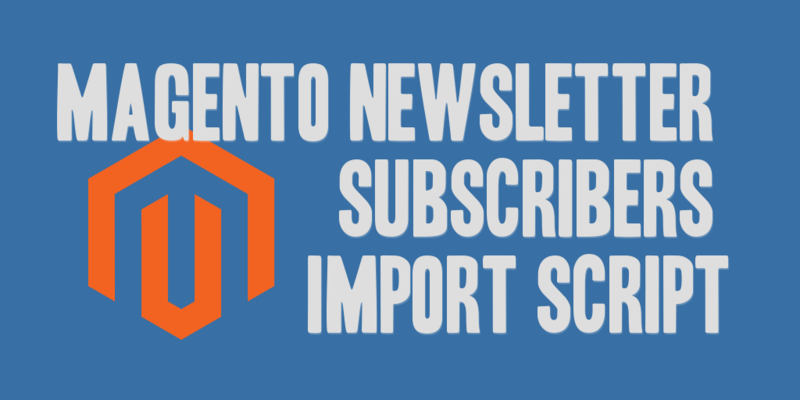 To accomplish this, I created a newsletter subscribers import script for Magento that helped them accomplish a quick import of their subscriber base that existed outside of their Magento installation. This script can handle one-off additions, as well as take a file upload, the format being one email address per line. It will also add the emails to the newsletter without sending a confirmation email that they’ve subscribed. To use the subscribers script, you’ll need to change one thing, the require_once import path to point to your Magento installation’s Mage.php file. I would also recommend that you place the file within a sub-directory in your current Magento installation, such as "newsletters", to allow you to easily access it for use (i.e. mydomain.com/newsletters/import_subscribers.php). Thanks for sharing this guide, I was trying to setup newsletter for my Magento store, I had to send them black Friday campaign, Your post helped me a lot in configuring this.